Have you tried Bark Thins? 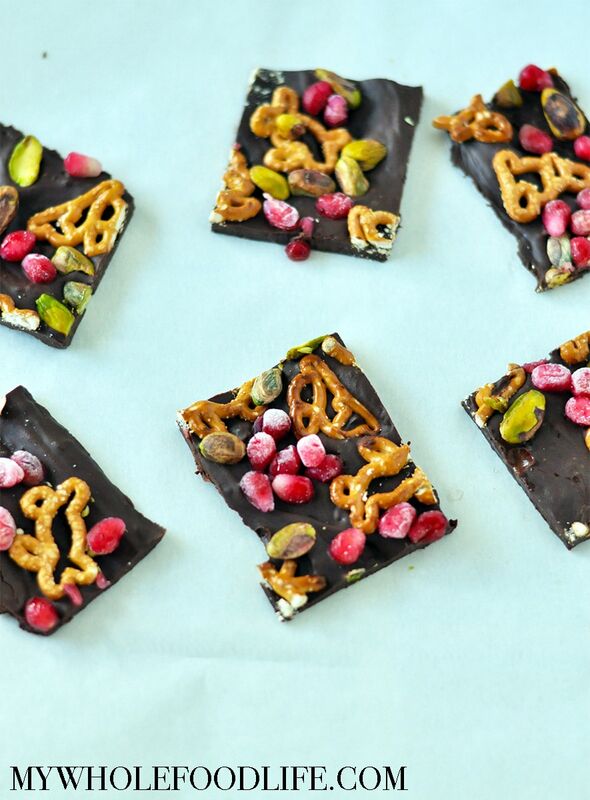 I LOVE the pretzel version, so that is where the inspiration for this Sweet and Salty Holiday Bark came from. I also added extra sweetness with the pomegranates and beautiful color with the pistachios. For more holiday recipes check out this post. This healthy dessert is super easy to make AND you can make it ahead of time. It makes a small batch, so if you plan on entertaining a crowd, then I suggest doubling the batch. I shot a quick video for this recipe. You can view it below. For more videos, you can subscribe to my You Tube Channel. This colorful and festive bark is perfect for the holidays. You will love the sweet and salty flavors. In a double boiler, melt the chocolate with the small amount of almond milk. Once melted, spread the chocolate onto a parchment lined baking sheet . Sprinkle the toppings onto the chocolate and gently press them in. Freeze until the chocolate has set. Around 4 hours. Once frozen, cut into squares or break into pieces. Keep the bark stored in the freezer for best results. Enjoy!